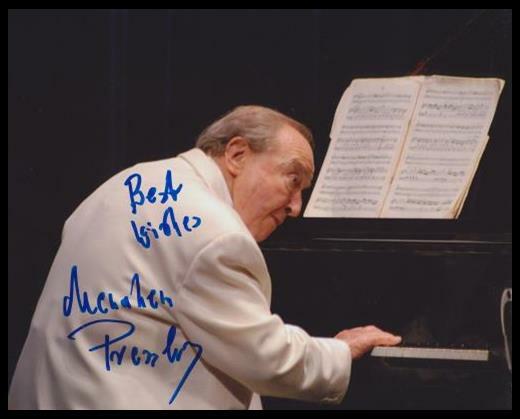 Autographed and inscribed 8” x 10” photograph of the great German born, American pianist. The amazing nonagenarian Pressler (1923- ) pursued a career as a concert pianist and touring throughout the World prior to World War II. He and his family escaped the Holocaust and he made his concert debut with the Palestine Symphony Orchestra, now the Israel Philharmonic. He won the Debussy Prize in San Francisco in 1946 after study with Eliah Rudiakow and Leo Kestenberg. Since 1955 he has taught at Indiana University and the same year formed the Beaux Arts Trio with Bernard Greenhouse and Daniel Guilet. The Trio still exists with Pressler and other musicians. The pianist recorded a rather large library with MGM during the 1950’s. In 2017 he performed with the Fort Worth Symphony during their Mozart Gala! In 2018 he performed with the Los Angeles Chamber Orchestra. He also has multiple concerts planned in several Germany cities from Berlin to Bad Kissigen, Belgium, Great Britain and the Netherlands in the Summer of 2018. Pressler released hi first Deutsche Grammophon solo album in 2018, “Claire de Lune”. He bills himself as the World’s Oldest Pianist!